I got lost in the language right away, the same way I get lost in a play in Stratford. Nothing about the production was distracting and I was smiling and laughing at all the laugh-line parts with the louder lady to my left. In a way, I was relieved. Getting there wasn’t much of an issue: My directions from Google Maps were great in getting me to Reservoir Park; finding the right pavilion, well, I take the blame for that one (as I should have written down the directions from the website). Anyway, I drove around the hill and by a Civil War museum and then eventually found the pavilion, parked the CR-V and got my lawn chair, my backpack, and my umbrella and headed toward the side of the hill where groups of people had set up their camps of chairs and blankets and food. I found a place somewhere in the middle left and unpacked my stuff , grabbed a program and looked around. “Oh, is this going to be a Renaissance Fair crowd?” I thought. Some college students were in front of me and there was a family eating their dinner behind me. I didn’t see much Starbucks nor anything fast food here. I honestly didn’t know what to expect from the crowd, let alone from the production. See, that last two Shakespeare in the park productions were very homey, but not easy to watch. What I mean is that the production of Midsummer Nights Dream in Mishawaka, IN and Two Gentlemen of Verona (Bloomington, IN) were good on intent, but not great on telling us the story. I say that cautiously because I have never performed Shakespeare in the park nor have I ever performed or acted as an adult (though I might contend that teaching is part classical theater and a lot of Improv). I remember liking the family feel of the audiences while also remembering the awkward pauses as an actor tried to remember a line. These were my experiences and I was looking forward to seeing a play that I have only heard of in a class on Shakespeare and other vague references. Tonight, though, I loved Cymbeline and I liked the crowd and I liked all of the cast. It was the same feeling that I’ve had when I’ve watched Shakespeare in Stratford, Canada, but a bit more intimate. Whereas during both performances I could close my eyes and enjoy the language and wacky story of Shakespeare, here in Harrisburg I could reach over a grab another Twizzler from my red backpack. After the performance last night (right as the rain began to fall) I could take a few steps and shake the hand of Imogen or Pisanio or Posthumus or Philario. This was really what free Shakespeare in the park is: a community of friends and family enjoying the talents of a few who have the ability and skill to translate Shakepeare into breathing words of characters in the kingdom of Cymbeline. I think I need to take a rhetorical break here and explain that my purpose this summer is not to be a theater critic: that was never my intent as I wrote the proposal nor do I possess the skill or muster up the energies to care about critiquing performances. In fact, I would make a horrible critic because I don’t like comparing between performances of the same play or trying to come up with something witty (though I do like my words sometimes). Every year I chaperon a trip to the Stratford Shakespeare Festival in Canada for our students and I avoid the intermission critique of the performances. It’s just not something that I enjoy and I’d rather get a cup of strong coffee than try and sound all expert-like over art. Instead, I like to talk about what I saw and what moved me. I’m a fan of the Reader-Response read and should find that I’ll do much the same here as I talk about performances. One other break from narrative: I think I will wait to reread the play after the performance. Waiting to see the performance first of Cymbeline proved this point for me again: you have to see Shakespeare first and then, if you are so inclined to be studious, then go ahead and read the play. I think this is one reason why we kill any hope for kids to even appreciate Shakespeare’s plays (or any play): We force students to read this thing we call “Literature,” make those kids understand the play by giving worksheets and historical background and projects and tests and then, if we have time, we might get a chance to watch it over a week’s time (having felt compelled to pause the film every 10 minutes to “process” the story thus far). Roll over, William Shakespeare…and Tennesse Williams and Ibsen and the rest. One day we’ll view and appreciate the art and honor it as art instead of an option on a standardized textbook exam. I think any production that you can’t follow the main plot line is probably one where something isn’t being translated well from the actors. I was reminded of this when we recently saw the Barbara Streisand version of Hello, Dolly! and figured out that there was really a reason why all those waiters were dancing and singing to her in the restaurant. We always sort of despised Hello, Dolly! because the live production we saw a couple years ago was slow and confusing and it seemed that there wasn’t that something moving the story along. Not last night though. The Harrisburg troupe defined their characters by not only their speeches but by their interaction with one another. Entrances were right on cue and not distracting (even when I could see Pisanio or Imogen or Postumus walking around the side of the pavilion, they were in character and their entrance looked like it was supposed to happen). I think one of the things I love about theater is when you forget you’re in a park in a lawn chair eating Twizzlers and you get lost in the story: the story becomes real and the illusion created by the playwright is embodied in the actors playing the parts. Sure, a siren or child crying might break the spell, but as the play goes on, so does the magic. Like in other comedies, I got caught up in the main love-couple and was happy that all was sorted out in the end. At least in my Riverside Shakespeare, Cymbeline is in a miscellaneous category of “Romances” along with The Tempest and a few other plays. These seem to be the plays that don’t fit the wedding at the end template that the other comedies have and that the news of two deaths at the end of the play do cast sort of a “Bummer, dude” smoke ring despite wrongs being righted. The characters that seemed to get a lot of the laugh lines were Cloten (which seems to be just a fun part to lay it all out there and whine and pout and eventually get your head chopped off) and Philario (the schemer and the one who gets reprimanded in the end despite everyone else living “happily ever after”). And, that’s about all the sorrow that is expressed for the Queen: she dead, let’s move on. Thanks to all those involved in the Harrisburg Shakespeare Festival production of Cymbeline; thanks for starting me out on the right road in this summer-long pursuit. Good luck on the rest of your season. Peace. I am the Executive Director at Gamut Theatre (the combined theatre company of Harrisburg Shakespeare Festival and Popcorn Hat Players Children’s Theatre.) I have to tell you that the buzz from this blog entry really made the rounds through our cast and crew and gave everyone a nice boost. As you know, we are a small company, so kudos on sites like yours are quite flattering. Thanks so much for the kind words. We are proud that we were your “first stop” on what is sure to be a memorable Shakespearean trip for you! 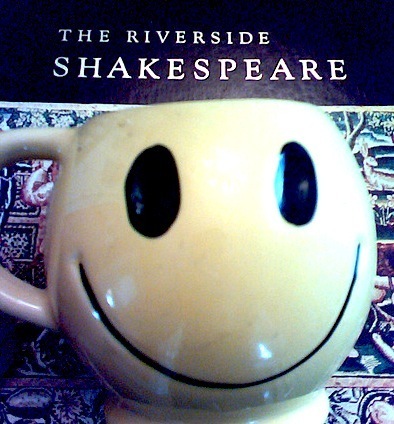 Our best from everyone at Harrisburg Shakespeare Fest ~ take care and break a leg! Hi Chris – Melissa N. sent me your link. I’m director of New Play Development and Marketing at Orlando Shakespeare. Fun project! Glad you made the stop to see the great people in Harrisburg! Thanks for taking a moment and leaving a reply. I have to admit that they cast and crew of “Cymbeline” has a special place in my summer and I see and write about the subsequent plays. Yes, it was the first production I saw, but also it becomes the standard whereby I see other productions throughout the journey. I am happy to have reflected back to the company the quality of the “almost-rained-upon” production almost a month ago. I hope that people in Harrisburg community continue to discover how fortunate they are for the Gamut Theatre and a chance to see free Shakespeare in the park. Continued luck in future productions and perhaps we’ll meet again. Thanks for stopping by the site. I was trying to make an excuse to get to Orlando, but as you see, I’m trying to do this in the summer. Good luck on your 2009-2010 season.